From the get-go, Catfish draws you in and doesn’t let you go until the credits are rolling. It’s human nature to be, somewhat, ‘nosey’ and Catfish allows us to be, ‘very nosey’ particularly with the main subject’s ‘love-life’ and Facebook friends. We witness, a twenty-something New York City photographer and his real life online connection that becomes personal, very personal with a family from Ishpeming, Michigan. What’s surprising is the turn of events near the middle of the film and the emotional affect they have upon the viewer. I’m here to tell you, that you’ll be shocked and astonished by the events that unfold concerning this online relationship. The film serves as a, ‘wake-up-call’ to Facebook users. Most people are wondering: “Is this story real?” My answer is yes, as the people that the filmmakers encounter, are totally believable. We all meet the Michigan family face-to-face and when we do, well, they’re the real deal. Trust me, as a film critic with a watchful eye, I look for loop holes and found none here. Nev is an interesting enough guy to watch on screen; good-looking, charming, vulnerable, artistic and an all around good sport. 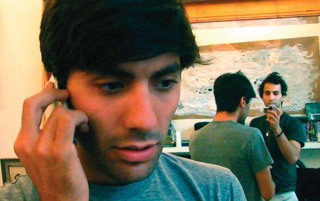 At one point in the film, he and his brother, Ariel, begin to argue about continuing the film project, as it becomes way too personal for Nev’s comfort zone. Henry Joost, a friend of both brothers serves as co-director and peacemaker between the brothers. When the trio flies to Vail to cover a ballet recital, the texts and cell phone calls from Megan heat up. 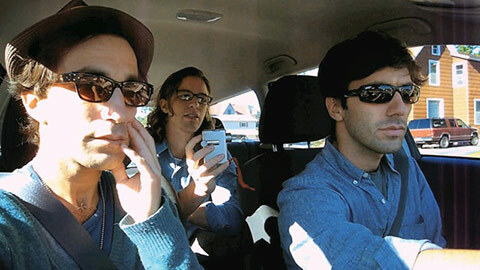 One evening, Nev is sent a link to view Megan’s musical talents. Becoming suspicious of this newfound skill, the guys find the same music on You-Tube and the artist is decidedly not Megan. With this questionable discovery, everything is now in question. They decide to trek to Michigan to meet the family and it can’t be soon enough. This is where the film gets good and this is exactly where you’ll find out no more, unless you see the film yourself. Nicely edited, the film flows as a documentary with Facebook screen shots added. There is also an interesting use of weaving the Garmin navigation system visuals into the film while the guys are traveling, the narrative keeps the film’s pacing and broadens our view of what’s happening.